For many businesses adapting to the fast-changing tech environment of the modern business world, keeping up-to-date on the latest communications methods can often seem difficult. That's why so many businesses still rely on tried-and-true communication systems for day-to-day operations, and bringing those systems up to modern standards is imperative. Case in point: faxing, and the need for robust, connected fax solutions. Luckily, Cloud Fax may be the solution that so many businesses have been searching for. Designed for maximum flexibility and compatibility with evolving business needs, Cloud Fax brings the added assurance of compliance and security needed by so many security-focused businesses. With just a few simple upgrades, businesses can upgrade their old fax systems to encrypted, compliant, and reliable Cloud Fax systems - bringing along a whole host of benefits designed to not only meet but exceed the needs of today's (and tomorrow's) most pressing business operations. 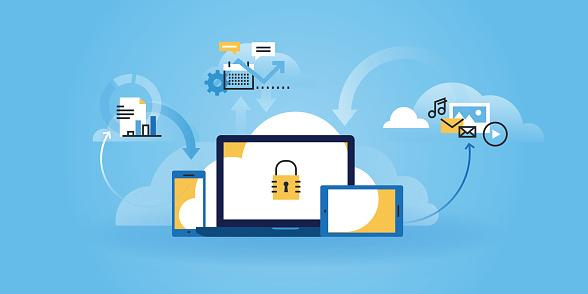 When properly implemented, cloud-based Internet Fax service securely sends, receives, stores and manages all of your business documents, helping you maintain compliance with privacy and security regulations like HIPAA and PCI. Designed with security in mind, Cloud Fax encrypts all your data, both in storage and in transit. This ensures that your data remains protected from hacking or theft at all stages of the transfer process, helping to stop those common sources of data leak that can affect so many privacy-focused industries. Additionally, Cloud Fax offers added security features to enable legal, medical and financial institutions to maintain compliance with HIPAA, GLBA and other industry regulations, creating a verifiable source of truth to prove compliance across all steps of the faxing process. While the benefits of Cloud Fax may be many, the thought of switching from a traditional fax system to a cloud-based solution may seem daunting for some businesses. That's why the best Cloud Fax solutions are designed for simple implementation and headache-free operation from the very first fax sent. Our P360 Cloud Fax solution allows businesses to keep everything from their old systems - including actual fax machines as well as all local and toll-free fax numbers. For those businesses looking to enhance the practicality and usability of their established fax systems, few options beat the reliability and security of Cloud Fax. Fortunately for businesses looking to leap into Cloud Faxing without delay, it's never been easier to implement a cloud-based faxing solution in your business than it is today. We strive to make setup and operation of your Cloud Fax system as streamlined as possible by allowing you to connect any standard fax machine to the Internet with P360 Fax's exclusive Fax Adapter. Simply connect a phone cord from your fax machine to the Fax Adapter, and connect the Fax Adapter to the Internet through your router or switch. The intelligent Fax Adapter connects automatically to P360 Fax, and you are ready to send and receive faxes. Support for multiple fax numbers per Fax Adapter lets you assign multiple local and toll-free fax numbers to each adapter. Businesses can also use multiple Fax Adapters with a single local or toll-free number, since P360 Fax lets you assign a local or toll-free fax number to multiple Fax Adapters, perfect for those who work in multiple locations. And because Cloud Fax is all about flexibility, many businesses can still choose from a wide range of compatible equipment options to best suit your document workflow needs. Users can send and receive faxes over the Internet using a fax machine or their choice of multifunction printers, scanners, computers, smartphones and tablets. At Pulsar360, Inc., we're passionate about making communication simpler and more flexible for businesses looking to evolve into the future. With our P360 Cloud Fax solution, you'll be better equipped than ever to ensure your fax documents are delivered quickly, safely, securely, and in full compliance with HIPAA and CPI. Interested in learning more? Get in touch and see what our Cloud Fax solutions can do to bring your business up to speed without ever missing a beat.